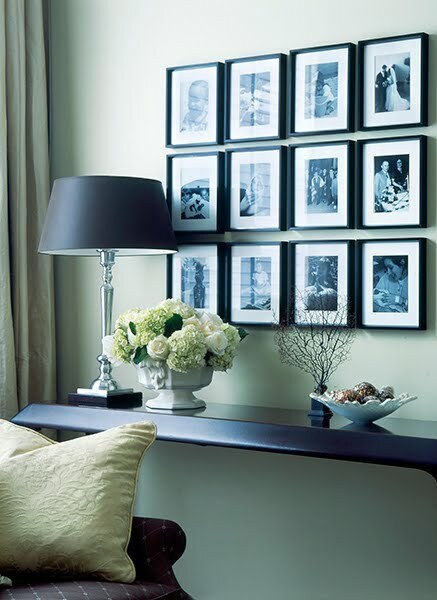 I am completely smitten with this gallery wall. I want to recreate this look in my house but create a time line of sorts. At the top would be photos of the fiance and I as babies. Then move along to photos of us dating and at the bottom end with a few wedding photos. Over time this could grow to include other important events and people in our lives together. It would be my kind of photo album for sure. I can see why you are smitten with this image. My wish for you is that the frames were only a dollar a piece. Can't wait to see it. Perhaps I left this comment before, but if you go to the Paul Smith store in NYC, there is one of my favorite walls with photos, letters, stubs and all sorts of little bits that go into making up a life. I have always loved this sort of idea, stacked, or randomly hung. What a cute idea! This just goes to show that displays of family photos can be cool and not kitschy. can't wait to see it too if you decide to go for it, the idea is really adorable!! I love the idea and have a few of these saved in a folder that are similar. My parents have a wall with all wedding photos of my grandparents and go back in time....and I'll be added to it soon. Such a great idea! Great idea! That is a beautiful image. This is great! I actually have very few family pictures around. I love having the pics, but displaying them is hard because I don't like hodge-podge much. This is so clean and uniform. I love it. Great idea. Can't wait to see yours! Yes. This is a great idea! One that I'd like to do one day. I love the idea. Just found you. I'm really glad that I did. Stop by sometime. I love this idea!! Thanks for sharing. That is a stunning picture. Classic, with a current twist. Love the photo wall! I love this idea. The order and balance of the frames is somehow calming to me; and then to have the frames filled with meaningful images would be terrific.